Octavia Zahrt is a Ph.D. candidate in Organizational Behavior at the Stanford Graduate School of Business. She is interested in innovative ways to help people thrive at work and beyond. 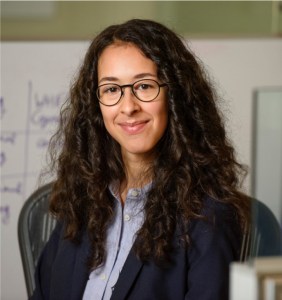 Her work draws on organizational behavior, psychology, and human-computer interaction to investigate wellbeing, engagement, and performance. Current research projects examine the influence of public health guidelines, wearable fitness technologies, and direct managers at work on people’s behavior and wellbeing. Octavia holds a bachelor’s degree in Psychology and Economics from University College London. The HERO Scorecard includes valuable data to better understand the role of leadership support in the impact of wellness initiatives on employee health and medical plan costs. An analysis was conducted of the HERO Scorecard database including responses from 811 unique organizations. There are various ways in which leaders can express their support for employees’ pursuit of wellness; these include public recognition and role modeling. However, descriptive analyses found that these types of leadership supports are quite rare. Specifically, among the 811 organizations represented in the HERO database, 28% report that leaders publicly recognize employees for healthy behaviors and outcomes. Furthermore, only 23% of organizations report that leaders are role models for prioritizing health and work-life balance (for example, by not sending emails while on vacation, taking activity breaks during the work day, etc.). Organizations can encourage leaders to be more supportive of employee well-being by holding them accountable, but again, this is rarely practiced in organizations. In the HERO sample, only 17% of organizations indicate that leaders are held accountable for supporting the health and well-being of their employees. Furthermore, only 14% report that leaders hold their front-line managers accountable for supporting the health and well-being of their employees. Of course, accountability may not be enough. Front-line and middle managers may also need appropriate support to be able to improve the health and well-being of their teams, such as training, adequate budget and resources. However, only 13% of organizations report that managers are given a lot of support. Another 37% say managers are given some support, and more than half (51%) of organizations say managers are given little or no support. Might leadership support, a relatively low-cost approach, be a critical factor shaping the effectiveness of highly comprehensive well-being initiatives? To address this question, subsequent analyses focused specifically on organizations whose well-being initiatives scored in the top 25% in terms of their comprehensiveness (henceforth: “top-scoring organizations”). Within this top-scoring group, further data analyses examined the association between the different types of leadership support and outcomes for those organizations that provided data on health impact (n=242) and medical cost impact (n=196) of their wellness initiatives. Top-scoring organizations whose leaders publicly recognized employees for healthy actions and outcomes were more likely to report employee health improvements (91%) and medical cost improvements (87%), as compared to top-scoring organizations whose leaders did not publicly recognize employees’ healthy actions and outcomes (83% and 81%, respectively). Top-scoring organizations whose leaders were role models for prioritizing health and work-life balance were more likely to report employee health improvements (92%) and medical cost improvements (96%), as compared to top-scoring organizations whose leaders were not role models (84% and 80%, respectively). Thus, even among a select sample of organizations who have invested in very comprehensive wellness initiatives, when leaders celebrated employees’ pursuit of well-being and shared their own healthy goals and actions, their organizations were much more likely to experience cost reductions and health improvements. Top-scoring organizations whose leaders were held accountable for supporting employee health were more likely to report employee health improvements (89%) and medical cost improvements (92%), as compared to top-scoring organizations whose leaders were not held accountable (86% and 83%, respectively). 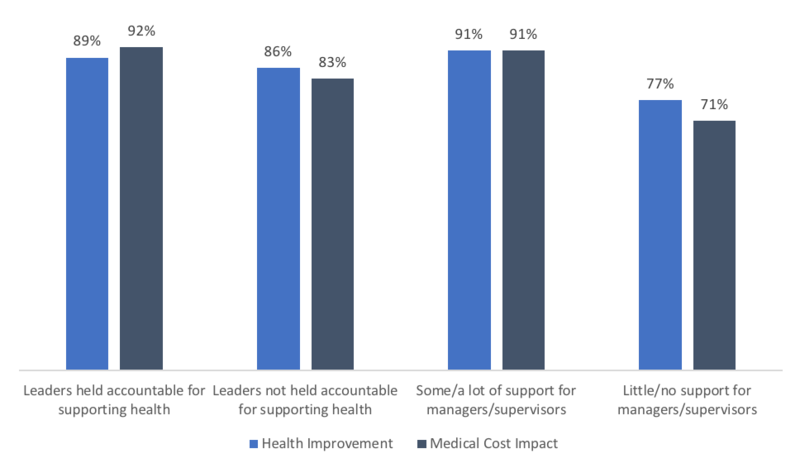 Top-scoring organizations whose leaders held front-line managers accountable for supporting employee health were more likely to report medical cost improvements (90%) than organizations whose leaders did not hold front-line managers accountable (84%). However, there were no material differences in organizations’ likelihood to report employee health improvements. Top-scoring organizations whose mid-level and front-line managers were given some or a lot of support in their efforts to improve their teams’ health were more likely to report employee health improvements (91%) and medical cost improvements (91%), as compared to top-scoring organizations whose mid-level and front-line managers were given little or no support (77% and 71%, respectively). These findings support the idea that holding senior leaders accountable for supporting employee health is associated with greater employee health improvements and medical cost savings, within the context of a comprehensive health and well-being initiative. Additionally, holding front-line managers accountable was associated with greater medical cost savings, though no material differences in employee health improvements were found. Furthermore, top-scoring organizations that gave mid-level and front-line managers at least some support in their efforts to improve their teams’ health were much more likely to report cost and health benefits than top-scoring organizations who were less supportive of managers. Given the cross-sectional nature of the data, more research is needed to establish causality and examine the mechanisms linking leadership support with employee health and medical costs. 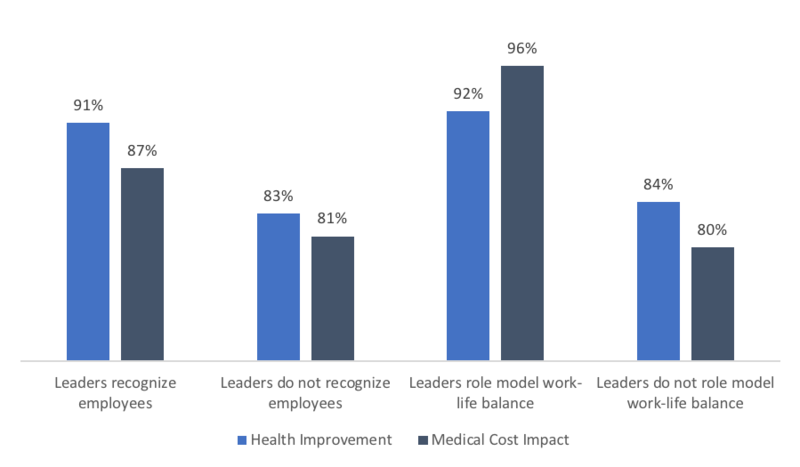 These findings suggest that organizations motivated to improve their employees’ well-being and save medical costs should consider the importance of leadership support. Even in organizations that offer very comprehensive well-being initiatives—including health screenings, behavior change workshops, on-site gyms, etc.—employees’ perceived lack of leadership support might act as a barrier to their participating in and benefiting from these initiatives. Importantly, it appears that leaders may be able to substantially boost the effectiveness of their wellness initiatives at a negligible cost: behaviors as simple as celebrating employees’ health promotion efforts and sharing leaders’ own well-being practices might empower employees to become happier, healthier, and more productive. HERO Scorecard Health and Well-being Best Practices Scorecard in Collaboration with Mercer. HERO Scorecard Benchmark Database through September 30, 2017. Osilla KC, Larkin JW, Eibner C, Mattke S. Systematic review of the impact of worksite wellness programs. American Journal of Managed Care. 2012;18:e68-e81. Limeade & Quaintum Workplace. Well-being and Engagement Report. 2016. Flynn J. Understanding the importance of organizational support. HERO Health and Well-being Best Practices Scorecard in Collaboration with Mercer Annual Report. 2014: 12-13.